36 W x 80 L x 8 H Inch - SHIPS FREE! 36 W x 80 L x 8 H inch w/ Defined Perimeter - SHIPS FREE! 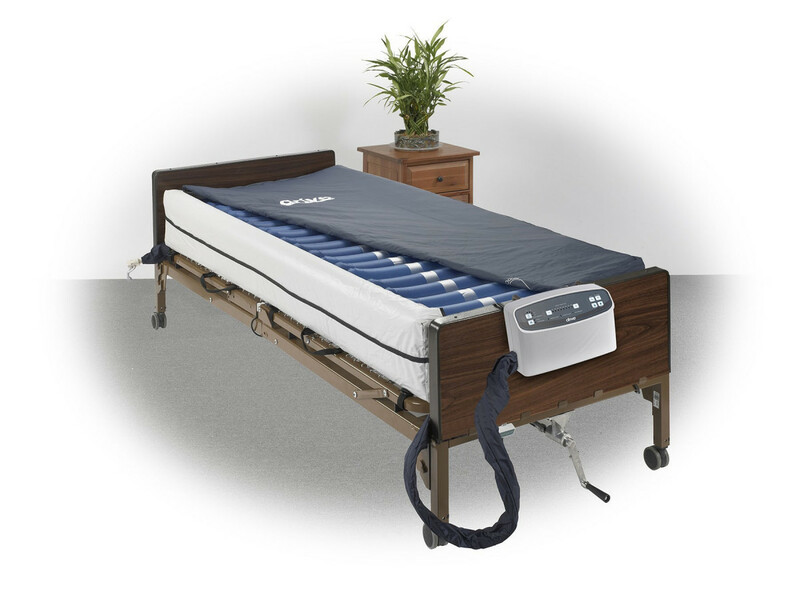 The Drive Med-Aire Plus 8 Inch Alternating Pressure and Low Air Loss Mattress System is specifically designed for patients who need to reduce or prevent decubitis ulcers. 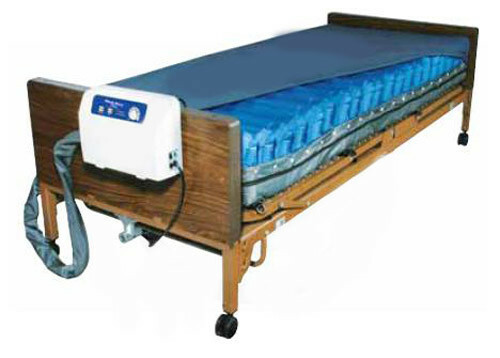 Through alternating pressure, the mattress can dynamically change patient pressure points and improve patient circulation. Other benefits of the system include microclimate control and friction reduction. The low air loss mattress is safe because it has air cells designed to minimize chance of mattress to bottom out. If there are any problems with the mattress, there are 3 audio and visual alarms that go off before it becomes a bigger issue. The mattress is made up of twenty different air cells. Three of these cells stay filled or static and are placed at the head to keep patient comfort during alternating cell therapy. Nine of the twenty cells are also designed with laser hose in order to keep the patient cool and comfortable. They also decrease the needed recovery time. 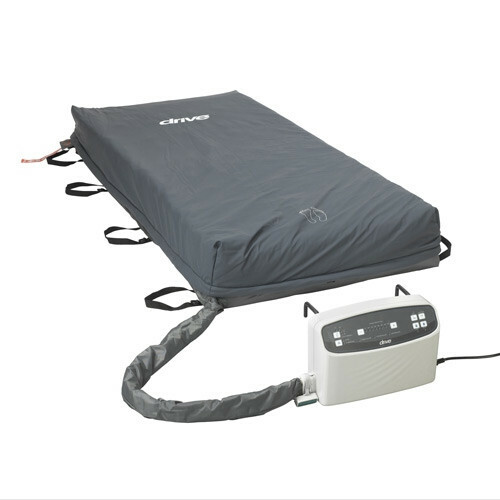 The pump included with the mattress gives eight liters per minute. When the air is pumped in, it goes through kink-proof spring lined tubing. In case of emergency, the mattress has CPR valves for incredibly quick deflation. 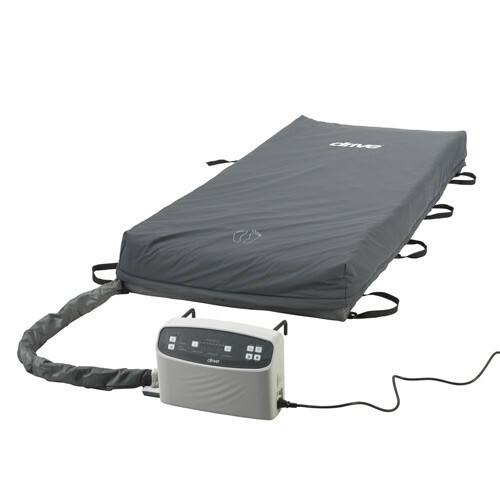 The Med-Aire Plus Alternating Pressure and Low Air Loss Mattress System is connected to a filter that has multiple indicators and buttons for a customized treatment. Even with its multiple options so you can find the perfect cycle and pressure, it is still incredibly simple. Around the mattress is a nylon cover. This ensures that the mattress will stay in great shape because it is water-resistant and durable. It will also stay clean because it is easily machine washable. There are three mattress system options with 80 or 84 inch length or a defined perimeter. 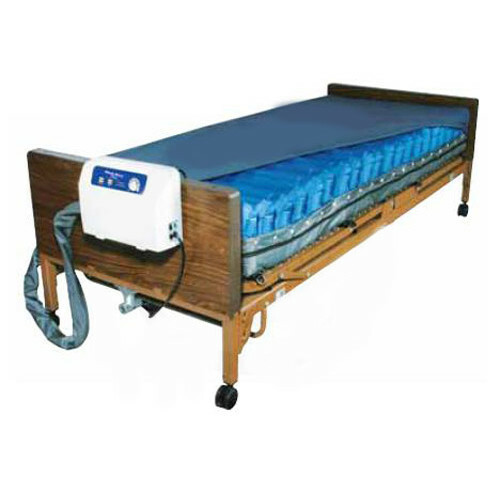 You may also be interested in similar mattresses also manufactured by Drive Medical like the 10 Inch Lateral Rotation Mattress that treats and prevents pressure ulcers using adjustable turning positions up to 40 degrees. Does this system have a warranty? The manufacturer warranties the item for 18 months. Can you deflate it roll it up and travel with it? 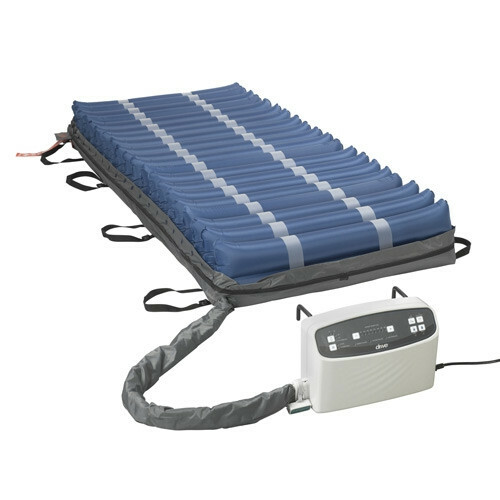 This is an alternating pressure mattress and does not inflate/deflate for travel. how much is the air pump that goes with mattress. This specific item has a pump included since it's an entire unit. For a selection of pumps, it's best to do a search for "home care furniture, beds, mattresses and accessories."